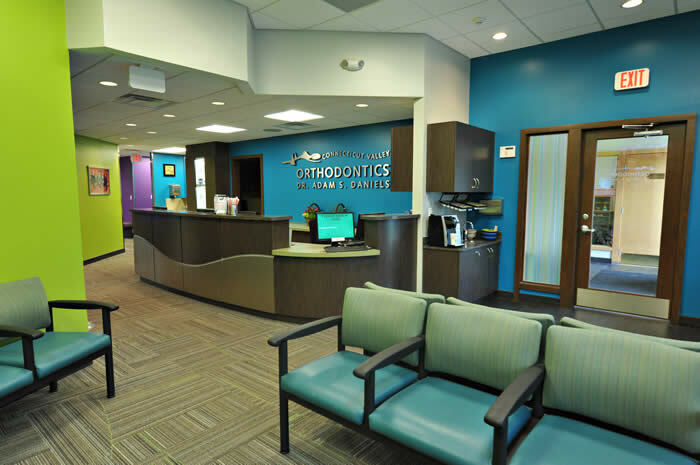 The design pallet began with the dentist’s favorite colors, combining bright greens and dark teal, reflected in the Connecticut Valley Orthodontic’s logo. 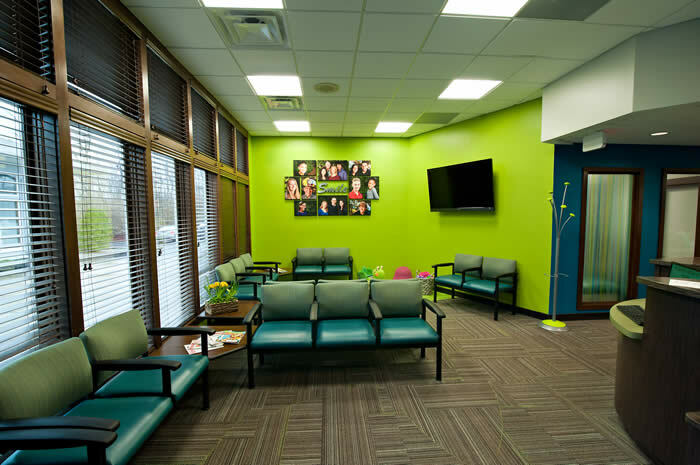 Green and teal hues were applied to the primary walls, as well as, incorporated into unique compressed glass sidelights at the entry and consult room. 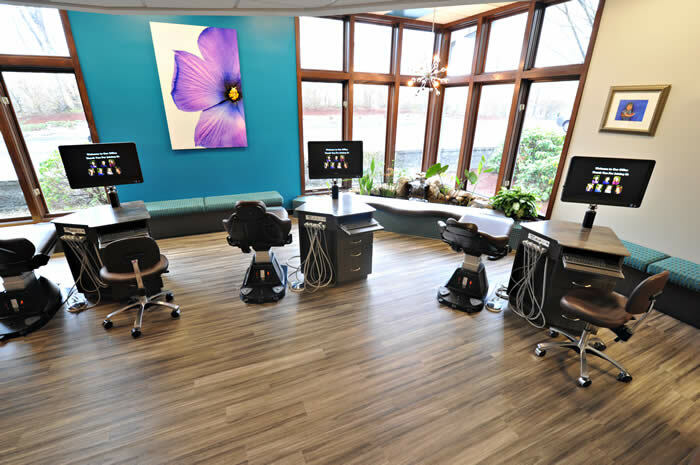 combining natural earth tones with high tech elements. On the other hand, the colorful walls scream this is a fun, cool environment. During the program fact-finding phase, Laura tossed out the idea of adding a water feature for a calming element. Dr. Daniels took that idea and ratcheted it up by requesting a salt-water aquarium. 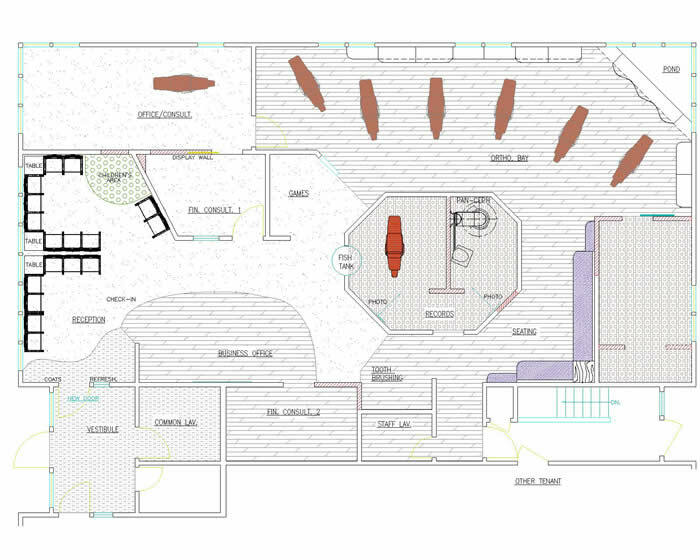 The team determined the aquarium should be cylindrical, centrally located and viewed from two sides, both from the waiting/check-in area and inside the records room. 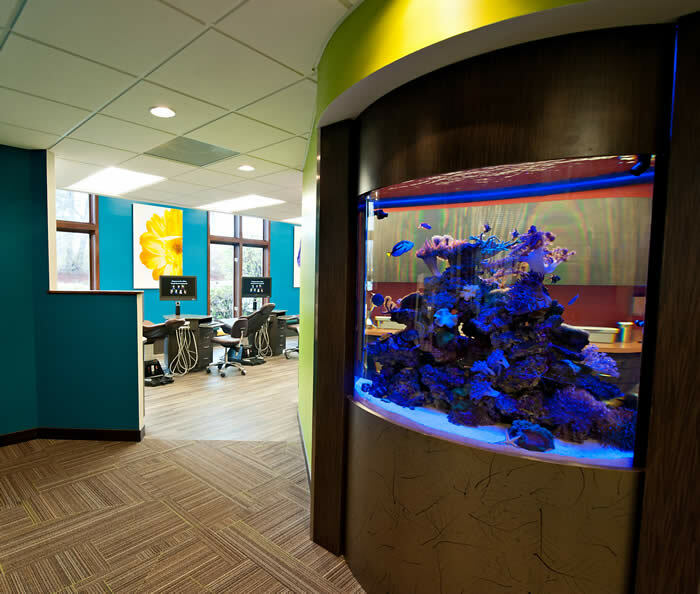 The elliptical aquarium shape mirrors the oval flow of the entire office. 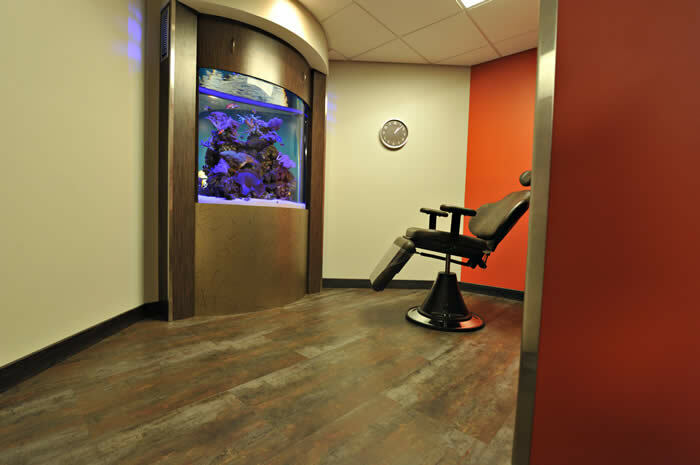 Dr. Daniels loves the calming effect the aquatic life has on patients prior to their procedures. This is especially evident in the records room while taking impressions. This procedure can be stressful and an unpleasant experience to many. However, when patients become mesmerized to the swaying soft corals and colorful fish darting about the aquarium, their anxieties and nerves melt away. A key requirement Dr. Daniels introduced, was ease of cleaning and low maintenance for all new finishes. Laura’s team, along with Dr. Daniels’ staff, tested many materials. 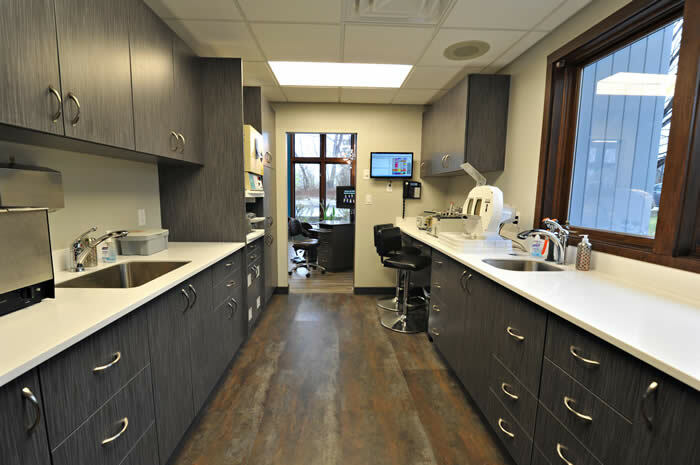 They went as far as using dental / lab tools to try to scratch & gouge solid surface products to obtain results. The realization was that the lighter the Corian material, the less visible the scratches were. 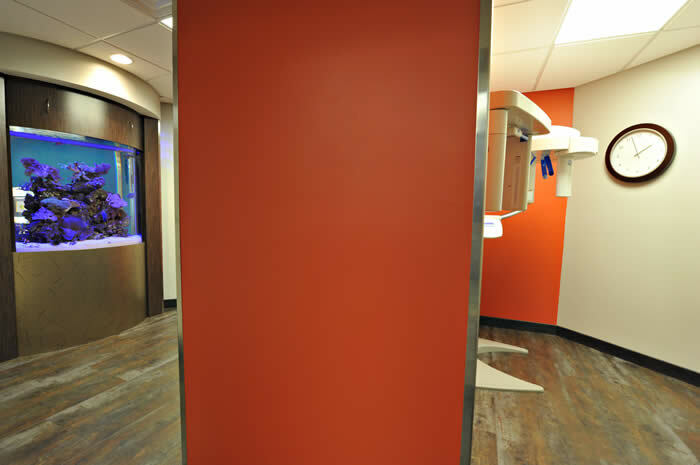 This prompted the design team to specify and install “Antarctica” Corian for the lab counters only. 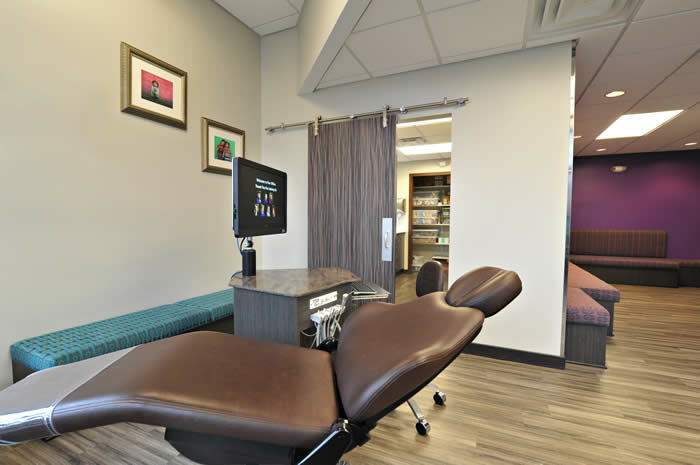 Dr. Daniels liked the idea of dark brown operatory upholstery, as it would not show scuffs. In addition, all his existing perimeter wood and door trim was a dark finish. 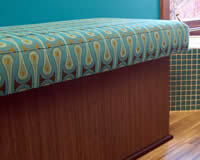 Laura added touches of sunny yellows on textiles for the upholstered benches which added warmth and balance to all the cool blue hues. 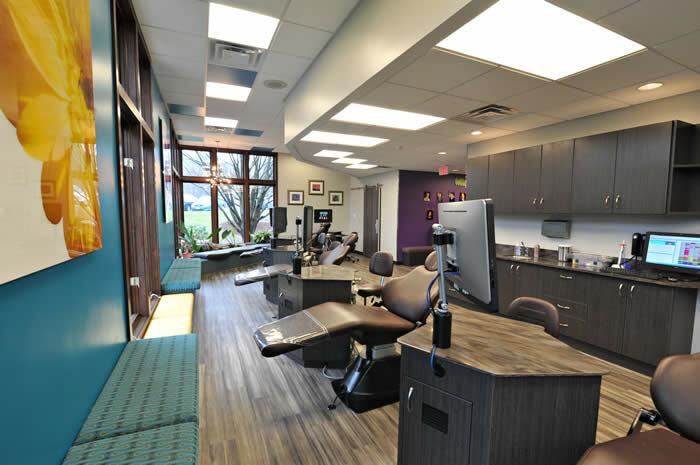 Adam requested Laura to include additional color choices to his offices. 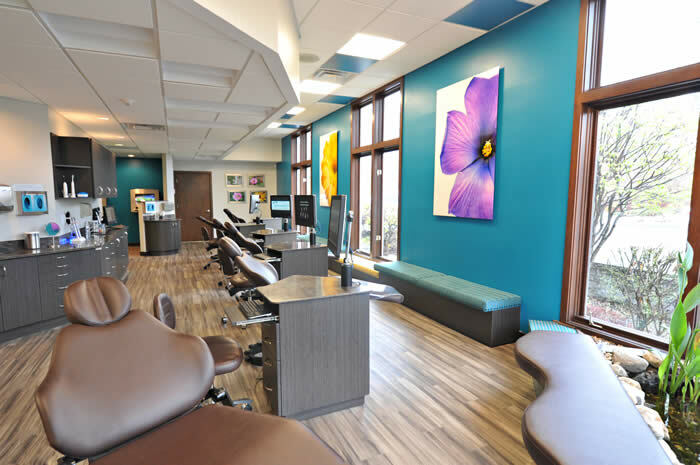 They selected a warm orange and playful purple hue as the secondary color pallet for accent walls and additional seating.